The lab-tested material responds to almost the same pressures as human skin and with the same speed, they reported in the British journal Nature Materials. Important hurdles remain but the exploit is an advance towards replacing today's clumsy robots and artificial arms with smarter, touch-sensitive upgrades, they believe. 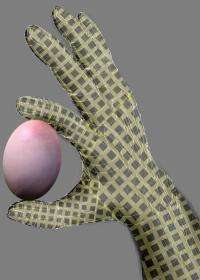 "Humans generally know how to hold a fragile egg without breaking it," said Ali Javey, an associate professor of computer sciences at the University of California at Berkeley, who led one of the research teams. "If we ever wanted a robot that could unload the dishes, for instance, we'd want to make sure it doesn't break the wine glasses in the process. But we'd also want the robot to grip the stock pot without dropping it." 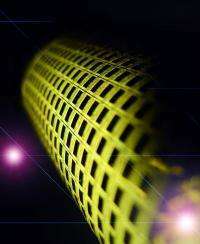 The "e-skin" made by Javey's team comprises a matrix of nanowires made of germanium and silicon rolled onto a sticky polyimide film. 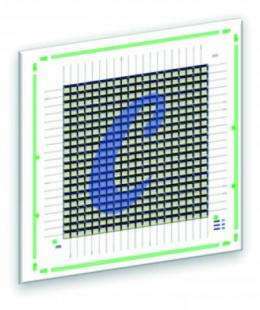 The team then laid nano-scale transistors on top, followed by a flexible, pressure-sensitive rubber. The prototype, measuring 49 square centimetres (7.6 square inches), can detect pressure ranging from 0 to 15 kilopascals, comparable to the force used for such daily activities as typing on a keyboard or holding an object. A different approach was taken by a team led by Zhenan Bao, a Chinese-born associate professor at Stanford University in California who has gained a reputation as one of the top women chemists in the United States. "Our response time is comparable with human skin, it's very, very fast, within milliseconds, or thousandths of a second," Bao told AFP. "That means in real terms that we can feel the pressure instantaneously." The achievements are "important milestones" in artificial intelligence, commented John Boland, a nanoscientist at Trinity College Dublin, Ireland, who hailed in particular the use of low-cost processing components. Touch, though, is widely acknowledged to be the biggest obstacle. Even routine daily actions, such as brushing one's teeth, turning the pages of a newspaper or dressing a small child would easily defeat today's robots. Bao added important caveats about the challenges ahead. One is about improving the new sensors. They respond to constant pressure, whereas in human skin more complex sensations are possible. This is because the pressure-sensing cells in the skin can send different frequencies of signal -- for instance, when we feel something painful or sharp, the frequency increases, alerting us to the threat. In addition, Bao warned, "connecting the artificial skin with the human nerve system will be a very challenging task". "Ultimately, in the very distant future, we would like to make a skin which performs really like human skin and to be able to connect it to nerve cells on the arm and thus restore sensation. "Initially, the prototype that we envision would be more like a handheld device, or maybe a device that connects to other parts of the body that have skin sensation. "The device would generate a pulse that would stimulate other parts of the skin, giving the kind of signal 'my (artificial) hand is touching something', for instance." "This would be especially useful in applications where we want to send robots into environments, including space, where it could be dangerous for humans to go," said Bao. "They could collect information and send it back." The moment tis is practically introduced, no longer a lab exercise, they will need an effect immune system and a nutrient transport system. We will have to foresee microbes or better, "Nano-probes" that violate or infect these prosthetic devices ESPECIALLY those that can adapt to the human-machine tactile interface. WHat about microabrasions and outright tears and breaks...we will need a pseudo-DNA command structure to organize repair without visiting the repair depot. Waste product removal: when that that was is too broken to repair (Apoptosis, for these machines) or needs nanological (as opposed to biological) upgrades, what is the down-time like? This is like the basis for a new, cybernetic super hero, or villain - in the distant future. Good to know wizardry is moving along. Biotech is nice, but I am looking forward to breakthroughs in the traditional fields of conjuration and evocation. On a more on topic note, I wonder how are they planning to connect this to the nervous system, when the time comes. From what I've read, there are several types of receptors in the skin, whereas this artificial sensor apparently replaces only one type.